From Goodreads – It is not a peaceful time in the Dells. King Nash clings to his throne while rebel lords in the north and south build armies to unseat him. The mountains and forests are filled with spies and thieves and lawless men. This is where Fire lives. With a wild, irresistible appearance and hair the color of flame, Fire is the last human monster. Equally hated and adored, she has the unique ability to control minds, but she guards her power, unwilling to steal the secrets of innocent people. Especially when she has so many of her own. Then Prince Brigan comes to bring her to King City, The royal family needs her help to uncover the plot against the king. Far away from home, Fire begins to realize there’s more to her power than she ever dreamed. Her power could save the kingdom. If only she weren’t afraid of becoming the monster her father was. Okay, I know I’m a little late to the Fire party. I’m a huge fan of Graceling and Bitterblue, and I’ve owned a copy of Fire for a few years, but for some reason I was hesitant to pick it up. Palace intrigue, rebel lords, blood thirsty raptors, and “human monsters” were not terms that drummed up a lot of interest in me. Crazy, right? Because after Graceling and Bitterblue, I should have just trusted Kristin Cashore to bring an amazing and affecting story, fantastical or otherwise. That’s exactly what she did with Fire. Fire is a simpler, quieter story than Graceling and Bitterblue, and I mean that in an incredibly complimentary way. Even though Fire is unnaturally beautiful and capable of influencing minds, I found her easier to connect with than Katsa and Bitterblue. Despite her monster gifts, she’s really quite relatable: sensitive and smart and determined and devoted. She’s terrified of her lineage, of the man her father was, and what her past means in terms of the type of woman she might become. I found this aspect of her personality particularly fascinating. As he left to answer the call, she heard him exclaiming in wonderment on the rise. “Rocks, Nash. Is that a river mare out there? Do you see her? Have you ever laid eyes on a more gorgeous creature? Fire is a dazzling and engaging story, one full of surprising twists and poignant moments that gave me all the feels. 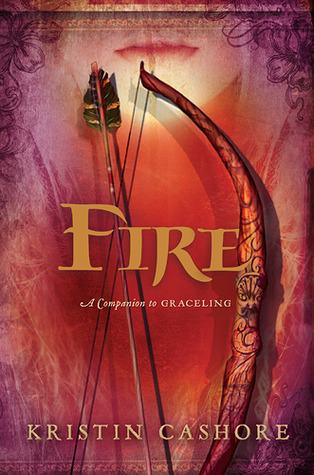 Even if fantasy is not your genre of choice, I still recommend giving Fire a read. Kristin Cashore has a talent for creating very real characters to populate her amazingly fantastical worlds. I can’t wait to see what she comes up with next! I’d forgotten about Brigan! I love Brigan! And I love Fire! It seems like it’s not as popular as the other two but I thought it was a great story and because I read it before Bitterblue I got very excited when she showed up in that story too! Maybe it’s not as popular because it’s a quieter sort of story? Whatever the reason, FIRE deserves just as much hype as its companion books. I loved it! Amen to that! It was a much quieter story and I think that was part of its charm for me. Loved it! The relative quietness of this book was definitely part of its charm for me, too. A new favorite! Great review Katy! I bought Fire as soon as I finished Graceling, but never read it. I think I was worried it wouldn’t live up to Graceling, I really must find it and read it. I’m glad you enjoyed it so much. I had the same worry, Alexa. I had my copy for about two years before I finally picked it up. So glad I did, though. It’s so different from GRACELING (other than the gorgeous writing), so I hardly found myself comparing the two. FIRE’s a beautiful story!